Boyds, Md. (October 23, 2018) – The Spirit’s Maryland and Virginia Academies took the field this past weekend in a set of challenging matches, with several teams collecting points. The busy match day saw Virginia Academy teams host PA Classics and Maryland squads travel to Northern Virginia to compete against Arlington Soccer Association. At the U-14 level, Spirit Academy – MD remains unbeaten this season as they improved their record to 6-0-1 with a 3-1 victory over Arlington Soccer Association. Payton Schenning wasted no time establishing her presence as she scored in the opening minute of the match. Going into the halftime break tied at 1-1, the MD U-14s added two goals in nine minutes during the second half from Sydney Bolinger (50’) and Sydney Feller (59’) while keeping their opponents from finding the net the rest of the way. The squad has been consistently dominant on the offensive end throughout the season, scoring an impressive 23 goals in its seven matches. The defense has equally contributed to the success by only conceding four goals and producing four shutouts. 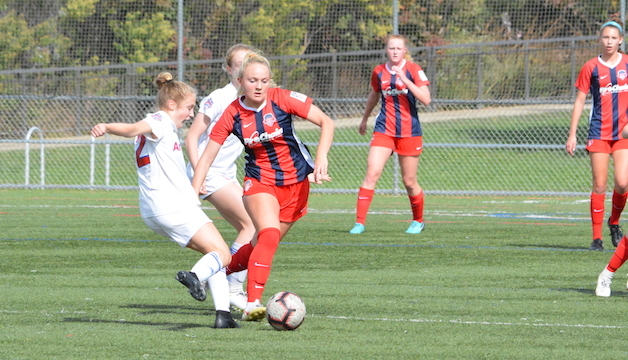 Coming off a victory last weekend against their Maryland Academy club-mates, The Spirit Academy – VA U-18/19s continued their winning ways by defeating PA Classics 7-2 on Saturday. Jasmine Hamid notched a hat-trick while teammates Gabrielle Robinson (28’), Caitlin Sutton (50’), Maddy Oliver (56’) and Anna Viscovich (77’) contributed to the score sheet. Hamid found the back of the net in both halves of the match, scoring the 31st and 67th minute followed by an 87th game-sealing goal. The upcoming weekend will see both Spirit Academies in action as they face off against one another in a Spirit showdown with all levels competing. The Maryland Academies find themselves on the road for the second week in a row as they make the trip to Lake Fairfax Park this Saturday to match up against the Virginia Academies. Time's running out to register for upcoming Spirit Academy – Maryland ID Sessions! Don't miss your chance to rep the #SpiritFam in the #GirlsDA!